1540 31.12 0905 KXEL Waterloo IA "Newstalk 1540 KXEL". Q2. It was the lower part of the mw-band that generated good signals in the morning of Dec 28th. 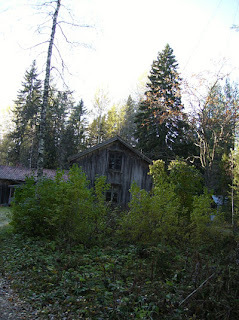 in Fredriksfors. Unusually early and good signals from Alaska and some west coast. After 8 UTC signals faded away, starting at the low side leaving some signals for a while on the highter part of the band. Later on the most usual east ciast and west coast stations went on but no southern nor midwest-signals. At 23 UTC there was the first program from new ARC Radio from Morokulien. Easy audible at least in the first part. You should see this, Bing! 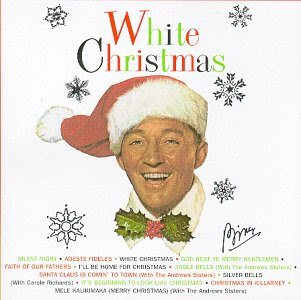 This has been the whitest Christmas you could ever dream of! Not only a positive thing as we were isolated out here in the shack for a while until a tractor arrived and opened up the roads to civilization. The conditions have been a bit special in that almost exclusively West and East Coast stations plus some Alaska have been heard but nothing from the rest of the North American continent. Many NA stations are also heard in daytime, including many from AK. Logs will be further updated. The special transmissions from Morokulien have also been picked up with a reasonable signal here. Surprisingly good signals from Hawaii, Alaska and the American west coast this afternoon, though a slight auroral disturbance (visible on Canadian RWC) usually blows ut all such signals. Interesting start in the evening also and then god signals (espescially on the low side of the band) from Alberta and Saskatctewan but also North Dakota. These signals faded in most cases out in the morning, leaving only some of the strongest and most western stations. Instead some stations from the Westi Indies and northern South America were audible with very good signals. I spent most of the time looking for 890 kHz but only god Todelar there. Fredag 18/12 c:a 10.40 medverkar BE från ARC i P4 Radio Värmland för att berätta om Arctic Radio Morokulien. Du kan lyssna via http://www.sr.se/webbradio/?type=live&Id=204 Förmodligen kan programmet även avlyssnas i efterhand. In the Peace Kingdom Morokulien, located right on the border between Norway and Sweden, just northwest of Charlottenberg, ARCTIC RADIO CLUB will be starting a new radio station (RSL-restricted special license) on mediumwave on December 28, 2009 thanks to good cooperation with the chairman of Arim, Amateur Radiooperators in Morokulien. Arctic Radio Club of Sweden and the Peace Kingdom Morokulien jointly celebrate their 50th anniversaries by these broadcasts. The radio station's main frequency is 1584 kHz, but some test broadcasts will also be carried out on 1602 kHz. The power is approximately 400 watts. The coordinates of the transmitting station is: N 59 degrees, 56 min, 15 sec. E 12 degrees, 12 minutes, 30 seconds. All information about transmissions, frequencies and possible additional test transmissions will be announced in our ARC News Flash. 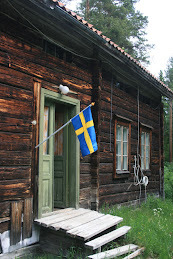 All times are Swedish Standard Time (UTC + 1 hour). Programmes will be in Swedish, with some parts in English. Station identification will be in both languages. ARC concludes its celebration with broadcasts on Sunday 10 January, 2010. For those interested, a unique QSL card will be printed. This is of course, a QSL card for the first medium wave transmission from the Peace Kingdom Morokulien. Reception reports are welcome to the above addresses and if you request a printed QSL-card for the correct reception report, please include 2 stamps, IRCs or $ for Swedish domestic postage.If you want to be notified of further commemorative broadcasts in 2010 please send us your email address. Signals propagated very good Dec 8-9th when I was listening in Fredriksfors. Many stations and strong signals. In many cases, however, too many stations on each channnel and very difficult to get a proper id. No sign of Big L on 1395 kHz over the weekend. It is only the pirates Energy Power AM and WNKR still fighting on the frequency. (Bengt Ericson, ARC, Växjö) It may not have any significance for the Big L comeback but one of the station's main profiles, Mike Read, is selling off his entire music library and related items on the 30th Nov 2009 at Chiswick Auctions (West London). Loggins from Fredriksfors Nov 18th. This night followed the same pattern as they have lately. Good signals early and up to, or even half an hour before, midnight UTC. Then a almost ”useless” night with few signals strong enough, and they who were, were insterad badly distorted and disturbed by strong splatter from the Europeans. Loggins from Fredriksfors Nov 17th. For a change I spent the afternoon in the schack in Fredriksfors. My choice was quite good. When I set the radio, all right the SDR then, at 12.30 UTC i would say all ”big” stations in Washington and British Columbia were good. When the sun rose there, quite a few stations from Alaska and even Hawaii came in instead. Sorry for a slight disturbance that silenced most of the stations an hour or even more to early. Loggings in Fredriksfors Nov 13th. Promising signals during the late evening, but then signals were flurry, distorted - and few! Quite a lousy night when I didn´t press the ”recording” button. During the morning it sounded better and better and it turned to quite good with some nice catches. 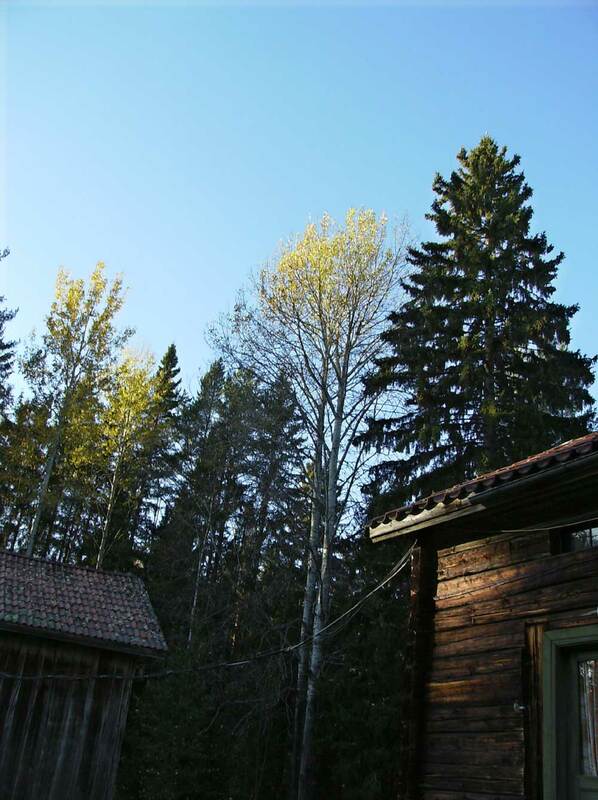 Rolf Larsson-RLF reports some recent loggings from the radio shack seen above. Obviously the conditions are still most favourable. Loggings in Fredriksfors Nov 7th. November 7th was a great night (and day). I had had a little too much in front of radio, I was tired and annoyed when the late morning signals wasn´t that great they had been. Our local disturbance on the most western antennas was another cause for dissapointment. Although I ”knew” that in just a couple of hours it would open up for signals from Alaska and Hawaii, I unpacked my things and went home. I missed the opening of the centrury, but I got quite a few new stations anyhow. Favoured at my listening post were signals from the Great Lakes and the midwest, above all at the sunset there, but there were signals from all the continent. Signals from the east coast, however, were in trouble as the inland was strongly heard already at 22 UTC. 570 7.11 0330 WMCA New York, NY med religiöst. Good signals from the east coast early in the evening and at our midnight (23 UTC) there was a nice sunset-opening towards MN, IA and even a KS (KGVB). Fredriksfors Nov 2 - could it be the disturbance? Home late from Fredriksfors this morning. When I arrived in the evening the band was filled with stations already and at 21.45 UTC already stations as WHLY 1150 and CIWW 1310 were strong. Sunset-opening from the midwest. However, the audio became more distorted and the stations tended to fade away after just a couple of minuts as the best. Difficult to get id:s then. At about 01 UTC most NA stations were gone and instread some Cuban, Colombian and Venezuelans (and also Dom Rep) came in, and later also again some western NA:s. At about 8 UTC we had to give up as the dusturbance then was to tough for us. On 1370 I had a station for quite a while that didn´t ”fit”. HK helped me to solve it; Radio El Rocio in Biblián, Ecuador. I hadn´t a thought of it although Teleradio was super on 1350. When HK then listened to the streaming audo from the station on Saturday 31st, they had for many hours and without any breaks, necrologues to the upcoming all souls day. There were some ”ups”, but also some deep ”downs” this night in Fredriksfors. Early and quite good signals in the beginning of the night. But soon it changed to be very distorted, almost impossible to here what was said though the strength was OK, signals and also the signals turned to the east and only some of the most common stations were heard.After sunrise it turned even more to the east and some Cuban and Venezuelan stations were heard, but also a couple of stations from Peru. 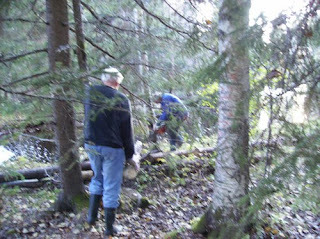 Two members of the Delsbo Radio Club - DRAK - collecting firewood for the winter. Left: Dan Edh. Right: Dan Andersson (chairman). Nice start, then dominants and noisy channels through most of night. However, it went better to quite good in the later hours of the night and early morning. But, when it was turning really interesting there was a huge backlash; A local disturbance that we have never heard before in Fredriksfors made listening impossible on the entire mw-band when using 345 degrees. Also audible on 317 degrees. After short before 7 UTC it was useless to listen any more. At times propagation was quite good in the morning of October 13th, but also with some fade outs. Earlier in the night it was less interesting with mainly strong dominants. Signals propagated almost entirely from NA (the whole, very wide opening), but not even a trace of the most common stations from Venezuela and Colombia. It sounded better that it really was this night (Oct 8th) at the schack in Fredriksfors. Most station that could be identified were well k nown before and with very strong dominants from Alberta and neighbouring areas. Lots of stations in Fredriksfors Oct 6. It was quite hard work in the dx-scahck in Fredriksfors October 5-6th. Lots of stations and then difficult choices; High or low (band)?, east or west? Or possibly in the middle?. To that the signals were fluttery and it was quite noisy on the band. Many of the logged station are ”not the most common”, but still very few new. However, KXNT in Las Vegas was not what I had expected to hear. Ay about 04.20 UTC the NA signals faded out rapidly leaving just a few eastcoast NA and instead Cuban, Colombian and venezuelan stations. 1000 6.10 0300 KOMO Seattle, WA. Med 317-gradaren i drift för första gången så brakade den in med ”KOMO NewsRadio”. WMVA svagt i bakgrunden. Afraid of catching the swine flu? Don't panic! Here DJ Tony Blackburn shows how to avoid it. It started quite promising; NA a little earlier than usual with a little better signal strength than usual, on some more channels than usual, and a little less splattered than usual. But the fun ended up quite fast. It became noisy and fluttery and in all quie a lousy night.